NeurologyResidents > Case – It’s all about localization ! It's all about localization ! Reason for the consult: 30-year-old woman was found down, confused with left lower extremity weakness. Story: 30-year-old right-handed woman, from North Carolina, came here to visit her kids who are with foster parents. Last night, patient was found down on the side of the street, confused and unable to stand or walk. Mental status: reported as not alert, not oriented on admission, on time of exam was alert, oriented x3. Left lower extremity is flaccid, o muscle power in all muscle groups with absent knee and ankle reflexes, mute planter response. All other extremities are normal with normal reflexes. No tenderness in lower extremity, pelvis or abdomen. No tenderness on moving the Lt lower extremities. Elevated WBCs (15k) - normal CBC otherwise. Elevated CK (5000), normal BMP otherwise. ED prospective: it is very confusing where to start. Should we get MRI brain for stroke, or MRI spine for trauma since she was found down? or may be EMG to see why she is weak! Before the neurologist got involved: neurosurgery was called and recommended MRI of lumbar spine which came back normal, then recommend to start on steroids for possible cord injury and ordered MRI of C and T spine. Neurologist recommendations: please get MRI pelvis with contrast. Is it brain? no - difficult to have complete flaccid paralysis and complete loss of sensation isolated to one limb with the sharp demarcation (completely normal sensation above L1, completely normal upper extremity) seen in this case. Lower extremity weakness is usually an ACA territory, with preserved basal ganglia, muscle tone shouldn't be flaccid and sensations should be completely lost since thalamus can still perceive pain (remember, every in complete MCA infarction patients, they still grimace when you pinch their skin). Is it the cord? no - It can't be the cord since sensory loss and weakness are on the same side. Remember that anterolateral sensory system has to cross to the opposite side causing loss of sensation on the opposite side of the weakness. Is it the plexus? yes - absolutely. Sharply demarcated myotomal and dermatomal loss indicate a peripheral pathology. Out of the peripheral nervous system components, all the nerves supplying the lower extremity meet only immediately after leaving the cord, in the plexus. After the plexus, nerves separate in different directions. Is it the peripheral nerves? no - there is no disease that selectively and diffusely affect all nerves of one limb and sparing all other limbs. Is it the muscle? no - the patient has sensory loss as well. Why did you ask for MRI pelvis? If you are looking for the lumbo-sacral plexus, you will not be able to see it on lumbar spine MRI. You will need to look more laterally, along the psoas major, iliacus and track the sciatic nerve while exiting through the sciatic notch. 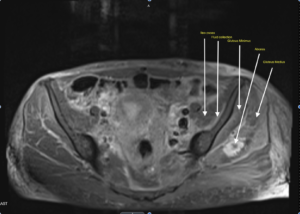 What did the MRI pelvis with contrast show? It did show severe myositis involving iliacus, pelvic floor muscles and an gluteas medius abscess. The patient also was found to have bacteremia, likely from IV drug use. She was found to have micro-abscesses in different locations as well. She was started on antibiotics and workup for infective endocarditis is going. Treatment: drainage of fluid collections, continue on antibiotics and physical therapy.